What does a slick-suited, tousle-haired, big-spending associate of Japan's infamous Yakuza drive? Apparently, as the saying goes, anything he wants. Meet Morohoshi-san. He's just a regular guy from Kabukicho, Tokyo's "entertainment district." His business, he says, is in a "gray area," so perhaps he's been arrested a few times. He may also keep council with a few questionable, heavily-tattooed characters. 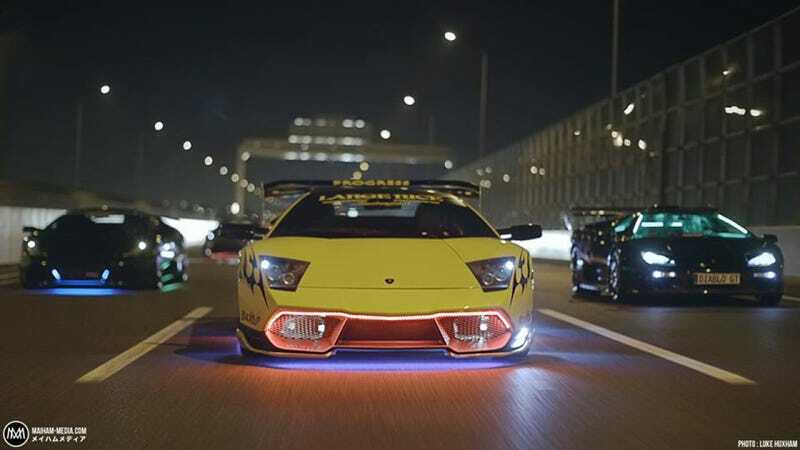 His car of choice is a modified Lamborghini Diablo. Why? He's got his reasons. That's the setup for this excellent mini-doc by Tokyo-based videographer, Luke Huxham. Huxham, who also did Racing In The Streets: Group C Porsche 962, has been producing short documentary style films out of Japan for several years, after having moved there six years ago with zero knowledge of Japanese or filmmaking. "I always enjoyed watching documentary style films, Huxham said, "So I one day decided to start trying to document aspects of Japanese automotive culture; This lead me to find [a] passion I never knew I had, cinematography. I am a one man film team that manages to somehow do the job of four people: storyboard, directing, editing, color grading, sound....the list goes on. Every project I go to people wait for me and my crew to walk in, they get a worried look on their face as I explain to them that I'm the only one." Every day in Japan you can see questionable looking people driving around in supercars. Where do they get their money? Who do they associate with? All these questions flooded my mind until finally I found myself behind my Canon 1DC surrounded by Bosozoku, brightly coloured flashing Lamborghinis and the Yakuza. Bosozoku in Japan are bike gangs with no real respect for laws, the general public or the police. They're obviously frowned upon, often causing problems for the general public. Very often they're the early makings of Yakuza. It's like a training ground. Some of them will grow up and become real gangsters. You can't really just walk up to these guys and ask them to be in your film. You don't walk into Kabukichou after midnight and start trying to film people with tattoos all over their bodies unless you want to have your nose broken. You need to know someone that has a good relationship with the people in these underground cultures and ask them to invite you in for as long as you're allowed to stay which is usually not very long! This is where we meet Morohoshi-san, a Lamborghini fanatic who's not shy about telling the world about his passion for Lamborghini. After a couple meetings, he also wasn't too shy to let us [Huxham and assistant director, K.T. Chan] explore his dark background and some his close friends surrounding his dangerous lifestyle. I started storyboarding this film months before it finally got to the two-night shoot. I found out very quickly that you can't really organize these types of people. You try to gather them up in one place and then make it to the next location while directing them, filming them, yelling at them from a chase car as you try to orchestrate these scenes you have envisioned. Your carefully planned, minute-by-minute schedule goes out the door, you're simply along for the ride with camera in hand. It's very stressful but also very surreal at the same time. You don't take in these moments until the next night when you sit down and start going through all the footage, and find out which parts of your original story are there, and which are missing. When you do these cultural documentary pieces you really have to embrace the run-and-gun style of shooting. It's horribly stressful but also a very rewarding experience at times. It's nothing like my commercial shoots where things usually go according to plan, and you're not still out at 4:30 am filming dolly shots of Lamborghinis. I would like to welcome to the world of an Underground Hero, a person some of you will love to hate. Remember, style is personal, fun is universal and Morohoshi-san is far too busy having fun to give a s*hit about what you think of his flashing neons. And even if we did think his flashing neons were lame, I'm pretty sure none of us would tell him to his face. We like all our fingers right where they are.